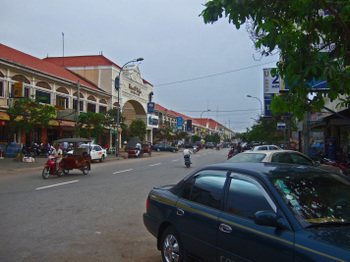 As I mentioned before, during the day, while the tourists are hitting the temples, Siem Reap is a calm and fairly sleepy city. 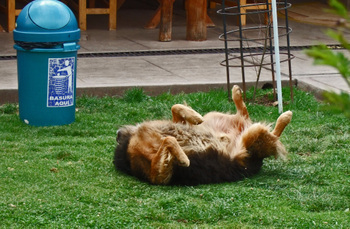 Whether it is due to the heat (95+ F, and humid), or the laid back attitude, things move at a pretty slow pace. 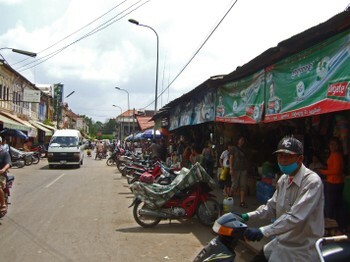 We had decided to keep our last day in Siem Reap wide open, just walking around the city a bit. Among the more interesting (at least for us) things we saw, was the Shrine to Ya Tep, a local spirit who is said to bring good luck. We thought the location of the shrine, in a traffic circle, in the middle of a street was fascinating. 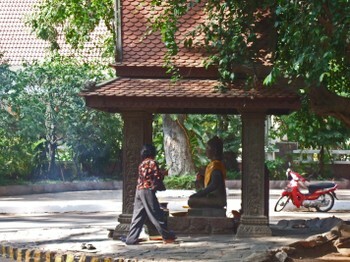 Right across the street is the Royal Gardens, and the Shrine to Preah Ang Chek & Preah Ang Chorm, two local dieties. The Missus was enchanted with the idea, and went over to the Monk, and passed over a few Riel (but did not touch the monk...that is a no-no). Suddenly overcome with indecision....not knowing what to do....instead of receiving any blessing, She high-tailed it back to our table instead. 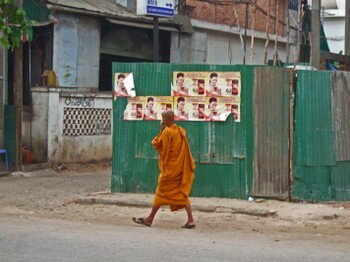 Leaving the Monk with a bemused, somewhat puzzled look on his face. 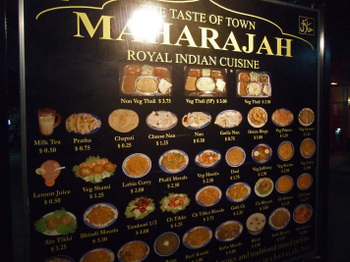 The coffee had stimulated our appetites, and we decided to grab a bite at a place we passed several times on previous evenings. 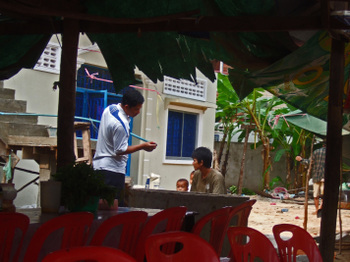 All over Cambodia, we found that a typical little eatery, or even cart for that matter, would have a collection of pots sitting on a table. 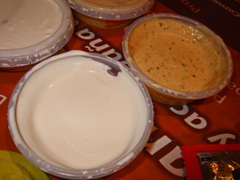 It is common to walk on up to the pots, open the various lids(if there were lids), peer inside, and order what you wish. 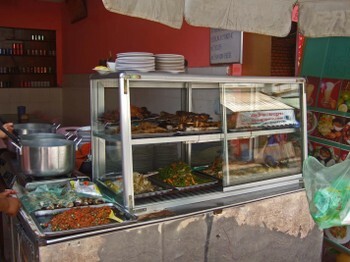 Every night we'd pass this little place, and the Missus would inevitably stop and start opening lids, checking out what was being served that day. Usually, because it was later in the evening, there wasn't much left. But on this day, the pots had just been brought out. So I got a nice bowl of Beef Stew. 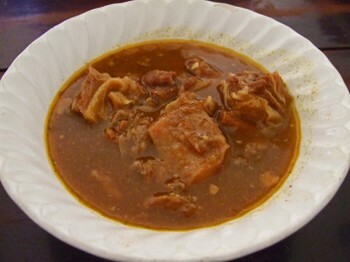 Very much like a cross between Chinese and Vietnamese Beef Stew, full of star anise and pepper flavor. The Missus got a Hot and Sour Pork Soup with what we usually call Ong Choi or Water Spinach. 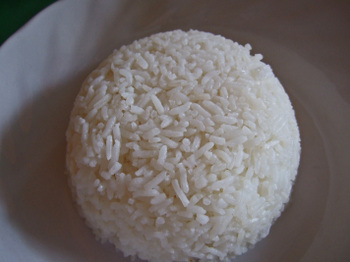 Each of us also received a plate of excellent Jasmine Rice. 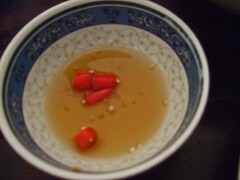 A little bowl of fish sauce and chilies was provided. 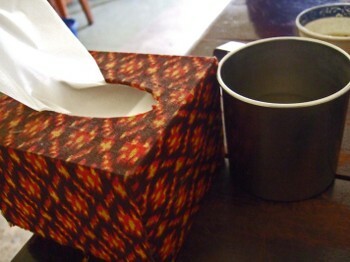 Along with the roll of tissue, a container of utensils was placed at the table along with a tin cup of boiling water. We learned that the hot water was used to sterilize our fork and spoon. At first we thought that this was such a nice, thoughtful gesture, showing concern to us tourists. 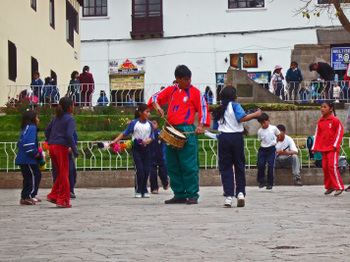 But as locals started to pour in, they were accommodated in the same manner. We sat, chatted, and watched the stream of folks stopping by, many with "tiffin containers", picking up lunch. 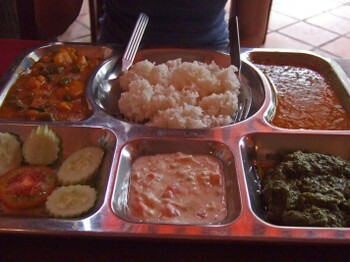 Lunch for two, with rice, and a large bottle of water ran us about $3.50/US. It was funny, the Lady running the place had remembered us, since we had passed by every evening. And so we felt that we should eat here. After lunch we wandered around Psar Chas a bit. 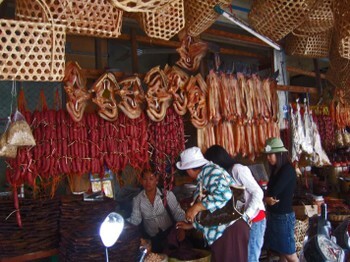 And even though the market is full of stalls selling various tourist knick-knacks and such, during the day there were much more locals around. 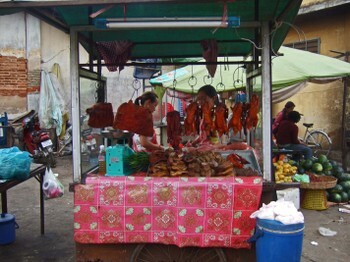 And many of the booths sold items such as various dried fish and meats. 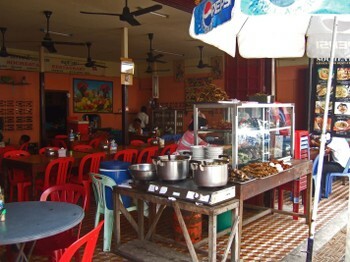 And one entire side of Psar Chas was dedicated to eateries just like the one we had lunch at. We really enjoyed the vibe....very relaxed. It may have been very hot, and all the tourists were either visiting the ruins or in their air-conditioned hotels taking a nap....but no time was better than now for an intense chess match! On the way back to the hotel we passed another street full of stands and couldn't help but go and explore. The Missus claims that the Longan She ate in Cambodia was the best She's ever had. 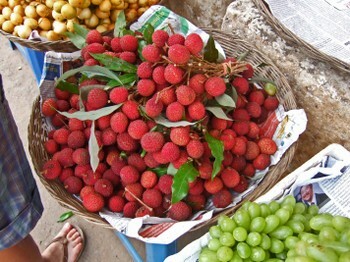 And having been allowed to taste one, I'd agree....even though one of neighbors growing up had a Longan tree, these were much sweeter. 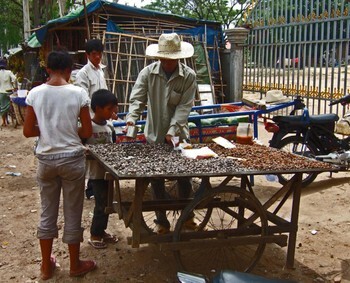 We also saw a very popular cart selling snails. Half of the snails were plain, the other half looked to be seasoned with chili pepper. Later that evening we got our first, and thankfully only, tuk-tuk ride (a story for later), and per the Missus' wishes had Indian Food for dinner again, this time at a restaurant called New Dehli, which turned out to be quite good. 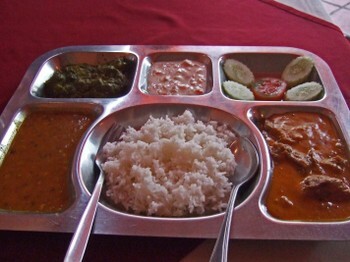 I had the Mutton Thali, the Missus the Vegetarian Thali. 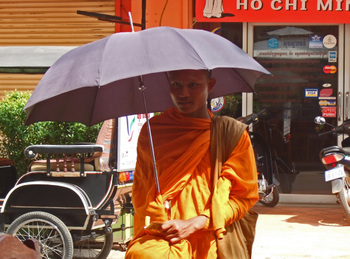 Yes, Siem Reap is full of surprises. 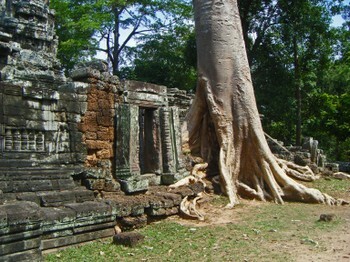 Siem Reap: Even more temples! 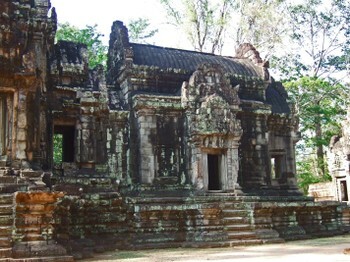 Called the "Citadel of the Cells", Banteay Kdei was built in 1181. 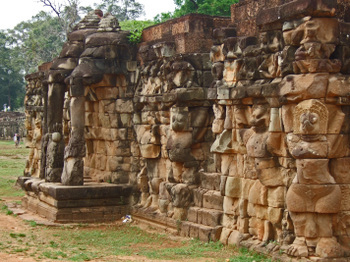 Banteay Kdei has been used as a monastery at different points in time. 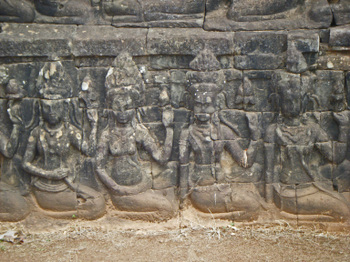 The most well known feature of Banteay Kdei is the "Hall of the Dancing Girls". 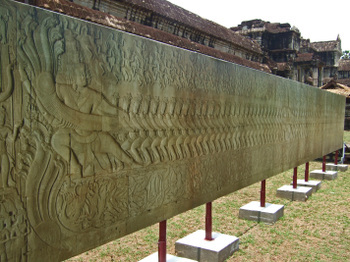 Where all of the columns feature beautiful bas-reliefs of Girls doing the Apsara dance. 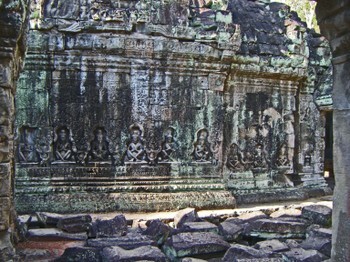 Banteay Kdei has been kept somewhat unrestored, making for some fascinating viewing. Some of which is due to poor construction and low quality materials. 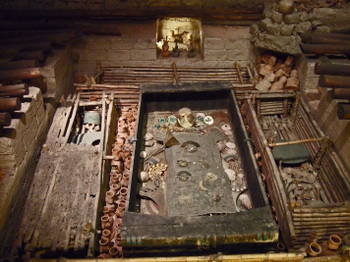 In addition, no one really knows who this temple was dedicated to, adding to the mystery. 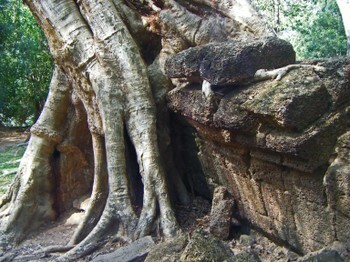 For us, Ta Prohm proved to be one of the more intriguing temples. 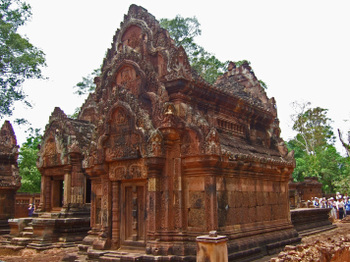 Built in 1186 by Jayavarman VII to honor his family, when the efforts to restore the temples of Angkor by the French began, the École française d'Extrême-Orient decided to leave Ta Prohm in it's natural state. 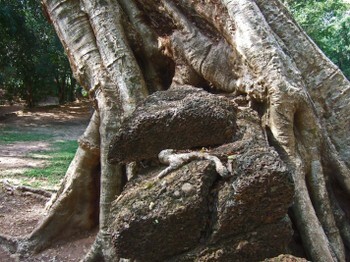 It's impossible not to gaze upon the giant Kapok (silk cotton tree) trees whose roots have have become one with Ta Prohm. 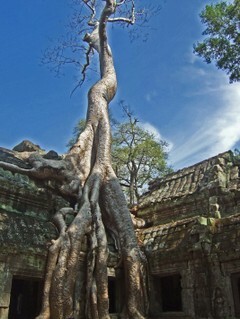 Several of the trees have taken root on the ceilings and walls of Ta Prohm, giving the temple an air of mystery. 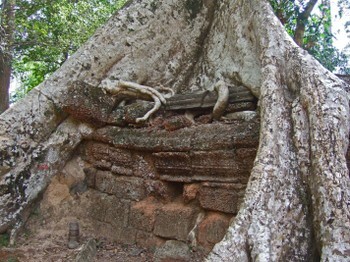 You see the roots of the Kapok trees snaking their way throughout Ta Prohm. 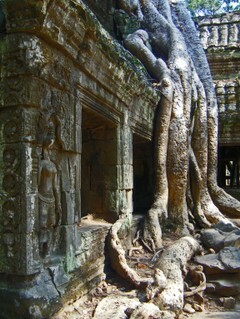 When FOY MrB checked out our photos of Ta Prohm, he immediately told me, "I've seen this as the set for Tomb Raider." 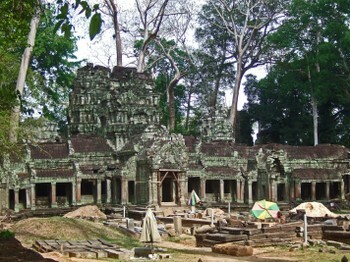 And he was correct, Ta Prohm is easily the most recognizable of the temples used as a backdrop for the movie Tomb Raider. 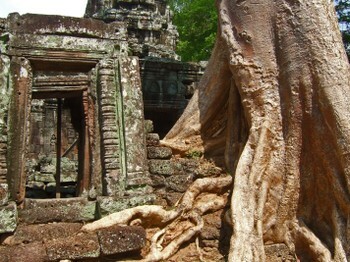 When we returned from vacation I read an article that mentioned the the Archaeological Survey of India will soon begin to do some restoration work on Ta Prohm. To my relief all work is planned so that the trees are "not disturbed in any way." 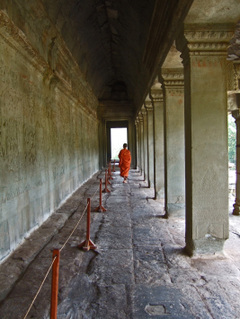 Wandering Chopsticks also enjoyed Ta Prohm. As we approached Ta Keo, we quickly noticed something unusual. There was no ornamentation, and it remained undecorated. 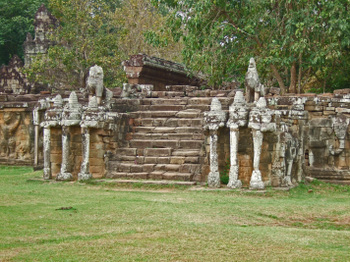 At around 1000AD, construction of Ta Keo ceased, and it was abandoned. 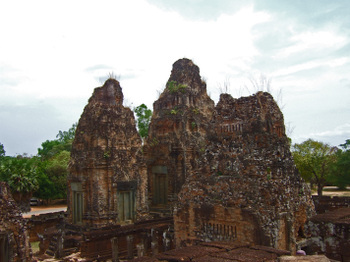 Legend has it, that Ta Keo was struck by lighting, which was seen as a bad omen. The temple of Thommanon is well restored, and small enough to enjoy quickly. But the thing we'll always remember the most about Thommanon is the poor fellow on the right. While his parents and siblings were enjoying themselves, he was having none of it. Yes, "temple fatigue" was rearing its ugly head. His parents and siblings viewed this with much good humor....his brother even made sure to catch some great shots with the camcorder. I'm sure the tired little guy will hear about this for many decades to come! 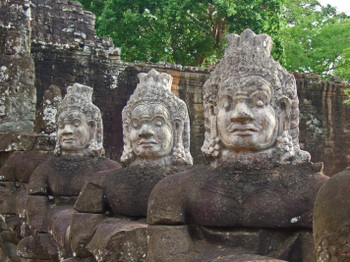 "Remember the time we went to Angkor, and you had a tantrum....."
Jayavarman II is credited as being the founder of the Khmer Empire, and according to legend, the Preah Khan, or "sacred sword" is said to have symbolized his power. 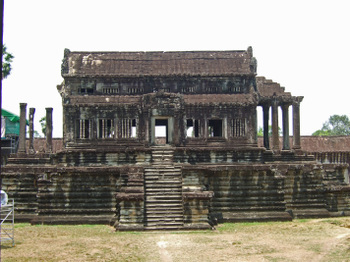 It is speculated that this was the home of the mighty sword, a copy of which said to still be hidden away at the Royal Palace in Phnom Penh. 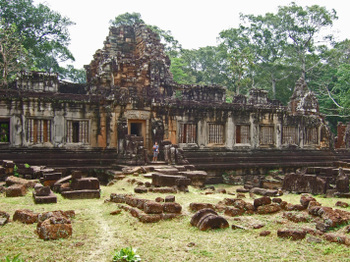 Like Ta Prohm, Preah Khan is left in a rather unrestored state. 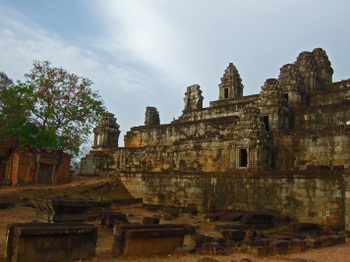 It is believed that up to 10,000 people lived within the walls of Preah Khan during it's heyday. And also that a prestigious and famous school was housed on it's grounds. 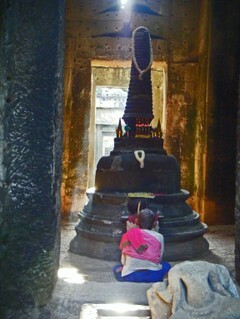 After Preah Khan, Narin asked us if we wanted to revisit any of the temples we had seen to end or day. 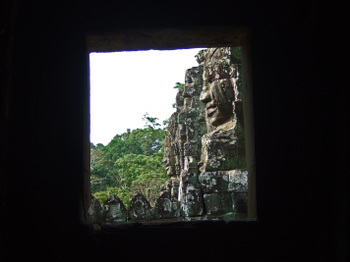 We decided that The Bayon had been our favorite site, and making a more detailed exploration of the wonderful bas-reliefs would be a nice way to end our 2 day visit to Angkor. It is less restored, and much more peaceful than the famous South Gate. 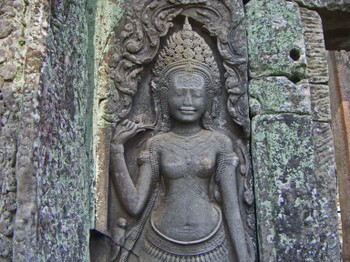 We ended our day, taking in the bas-reliefs of the Bayon in greater detail. Narin dropped us back at our hotel. We showered and headed out to dinner. 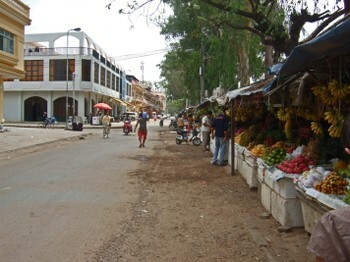 Siem Reap is an interesting town....during the day, it is very calm, and sleepy. 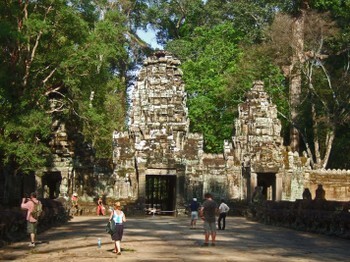 During the evening, after everyone has returned from the temples, it is a bustling, and busy tourist mecca. 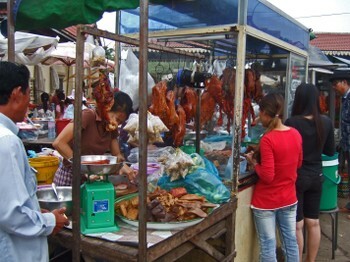 Though these street stands are more directed at feeding the locals. 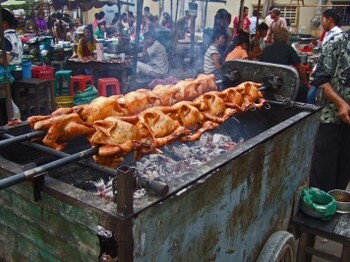 You'll find an interesting variety of food at these night markets. Chinese style roasted and BBQ'd meats seemed popular. With grilled items a very close second. 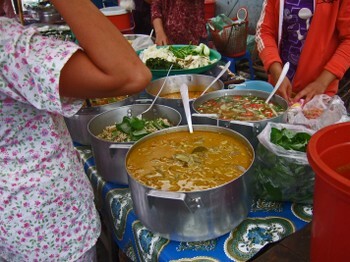 A very typical meal for the locals goes this way; you walk up to a stand full of pots. It is perfectly fine to peer into the pots. 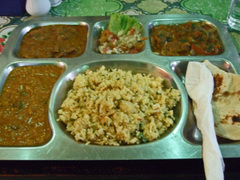 You decided what you want to eat, and your meal comes with whatever is chosen and rice. On this evening, noodles seemed to be very popular. 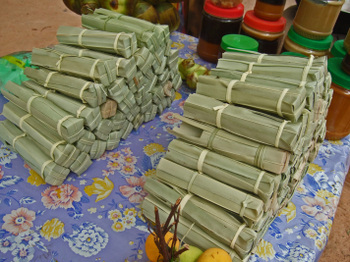 These stands use packaged dry noodles that are cooked and kept to the side. When an order is placed, the noodles are stir fried, with bean sprouts, soy sauce, hot sauce, and maggi, and sometimes served with a fried egg on top. A very cheap meal. So what did we get? Well, you'll just have to wait for that one! After our filling breakfast of Num Banh Chok, and a short stop to check out how palm sugar was made, we were on our way to our next stop, Kbal Spean. 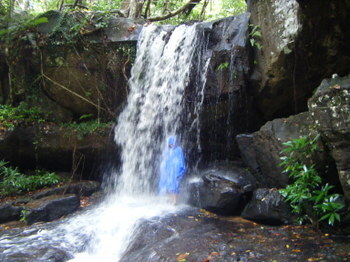 Kbal Spean is not a temple in the typical sense of the word. 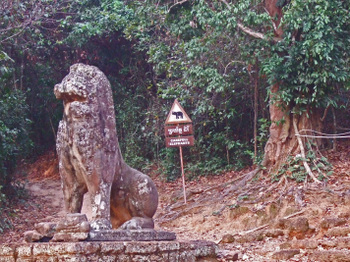 Located about 25 kilometers from Angkor Wat, Kbal Spean is a sacred site in the jungle. As we drove it started to rain fairly hard. 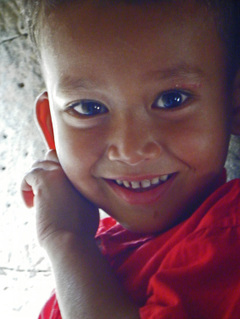 This made Narin turn to us and say, "you are good luck, we've been waiting for the rain." After a bit of sliding and mild hydroplaning, we arrived at a large field. 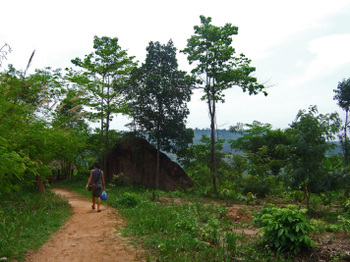 At the rear of the field is the trail to Kbal Spean. 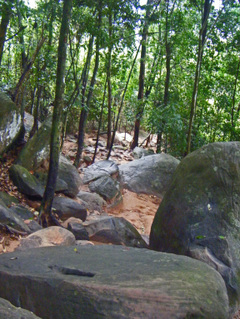 The hike takes about 20-30 minutes through the jungle. The trail was a bit slippery, but except for a few steep areas pretty easy. The humidity and the moisture made me feel like I was back home in Hawaii hiking. 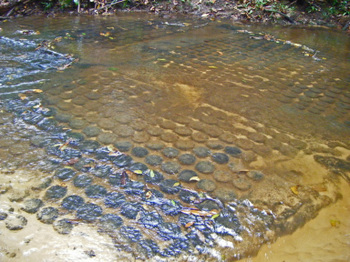 The main feature of Kbal Spean is the river, which contain carvings that have been done in the bedrock. 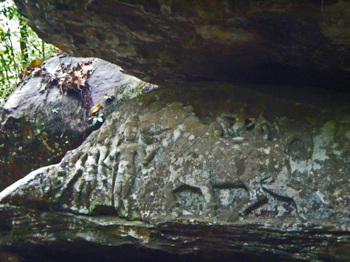 According to some of the literature we read; these carvings were originally made in the 11th century by hermits who inhabited the area. 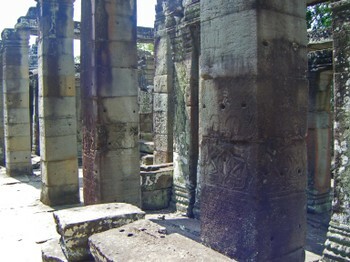 Many of the symbols are "Lingas", sacred symbols. We had arrived right after a very loud group of Young Japanese Tourists who were making a racket and walking back and forth over the stone carvings. Soon enough, a little Gentleman wearing a blue shirt emblazoned with a badge restored order. Seeing that there would be no more jumping over the rocks and walking across the river carvings the group soon left. The Gentleman, seeing that the Missus was interested in the carvings, gave us a little tour. It was a neat encounter; neither of us spoke the other's language, but somehow we communicated and understood each other through gestures and sign language. And of course, there are gestures that are universal.....especially the ones used to explain which of the carvings were fertility symbols! The water that passes over all of the symbols is supposed to be Holy Water. And of course you know the Missus had to get some of that! Luckily we had packed our raincoats! As I always say, we need all the help we can get. The hike down seemed amazingly short, and I felt refreshed by the change of scenery. And so we headed off to our next stop. It's the wonderful red color of the sandstone used for this temple. Making some of the carvings quite stunning. 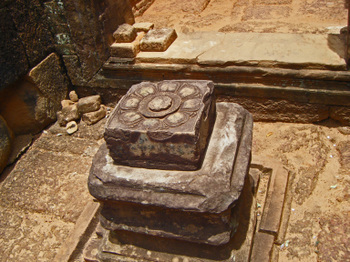 The other unique bit of information about Banteay Srei is that it is the only temple in Angkor not built by royalty. It was instead built by two brothers; Yajnavaraha, the court physician and trusted confidant of King Rajendravarman II, who granted them the land, and gave the brothers permission to build, and his younger brother Vishnukumura, who was a wealthy landowner. 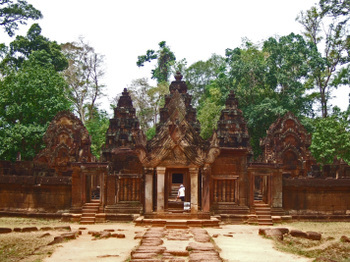 Whatever the history, this is a beautiful site, and quite deserving of it's modern name Banteay Srei, which I was told means "Citadel of the Women". 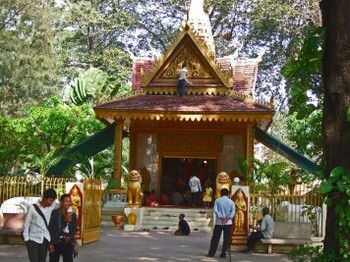 The temple itself is small, and can be covered fairly quickly, but chances are you'd want to take your time. This place gave me the heebie-jeebies. It just looked ominous.....and frankly kinda spooky. The place was also very empty. 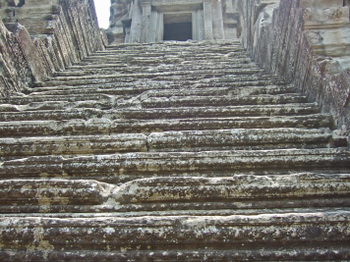 As I climbed up the temple stairs, I could imagine flying creatures with fangs swooping down to prey upon us from the crumbling spires. We got back to the car, and a more pleasant subject came up. Lunch! What did Narin order? 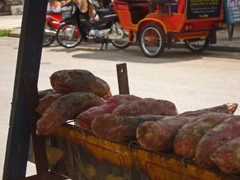 Narin ordered in Cambodian, so it remained a mystery, until it arrived. He had ordered Hamburger and Fries!!! The Missus and I looked at each other in astonishment. It was a platter of mystery meat disks, that by the two handed effort (no buns, Narin held the fork with 2 hands to bite, nay tear a piece off) necessary to eat it, must have been closer to jerky than meat. There were strips of soggy looking shoe-string potatoes on the plate as well. Later the Missus postulated that Narin had never had a chance to have a burger and fries, so he probably took this opportunity to sample "American food". After eating that garbage, I wondered what he thought of the American diet? Regardless of what he thought of what Americans eat, there's no doubt in my mind that he must think we have the strongest teeth and jaw muscles in the universe! There was one bright spot of the meal. 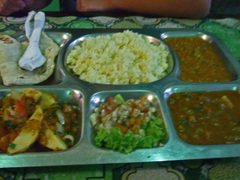 Narin had noticed that we enjoyed eating the local food much more than the tourist food, and brought by a little dish. More like a lake. And the breezes coming off the water gave us some relief from 100 degrees plus temperature. 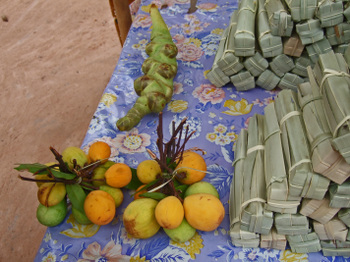 Siem Reap: Palm Sugar, and Everybody has a Durian story, right? As I noted at the end of my last post, we had just finished a repast of Khmer Noodles (Num Banh Chok), and the Missus had wandered off. It seems that She had been unable to ward off the temptation of fresh Durian. 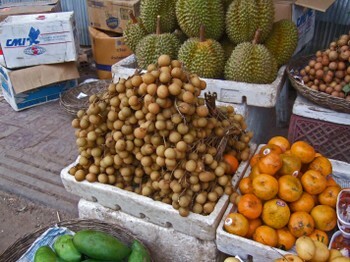 And having been suitably tempted, She purchased a nice fresh Durian. 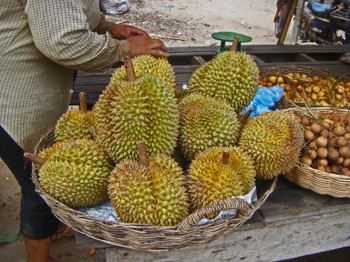 I'm sure that all travelers to Southeast Asia has at least one Durian story, and here's ours. The Missus has this Durian, the smell of ripe compost wafting in the air so thick I could have cut it with a chainsaw. She brings it into the car...now you must remember that we have a whole, hot, humid day ahead of us. Me: Did you really have to buy that Durian? The Missus: Looks good, huh? And I didn't see any "no Durian" signs around the hotel. Me (lowering my voice): You realize that this car isn't Narin's, right? He's probably renting it. And he'll return the car smelling like Durian. Suddenly, the Missus brightened up...it had all become clear, a solution presented itself. The Missus reached over, opened my backpack, placed the Durian into my backpack, and zipped it up tightly. I should've kept my mouth shut. To this day, Sammy will be walking past my backpack, he'll suddenly stop, sniff, and look up at me with an expression that says: "Daddy, did you poop in your backpack?" 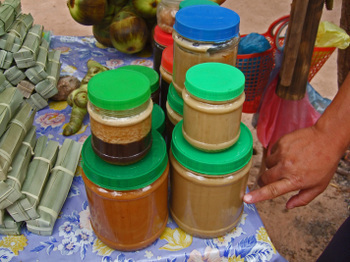 Narin showed us the various Palm Sugar products. 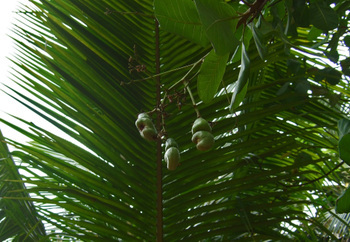 And even went over the fruit and differences between the male and female palm. Unfortunately, I flunked Palm anatomy and physiology, so I don't know which is which. 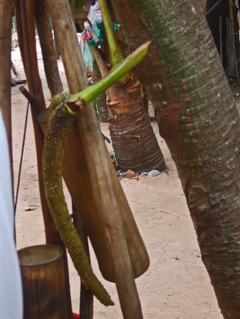 There was also a Cashew Tree, which fascinated me. I'd never seen one up close before. The nice lady even had the Missus taste a cashew fruit.....I could tell by the sour look on Her face, that I wanted no part of it. 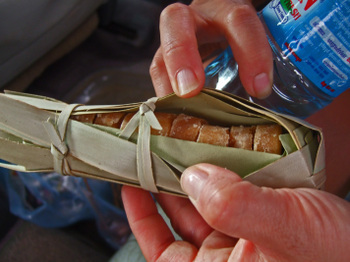 As our way of thanking the lady for being so gracious, as we found most all Cambodians to be, we ended up buying two tubes of palm sugar. This palm sugar is darker than the palm sugar I buy at the market here in San Diego. The flavor is a much more condensed "complex" sweetness. I used some in a Beef Salad I made, and because I used the usual amount of the stuff, it overpowered everything else in the dish! 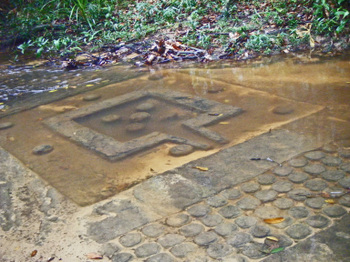 As we headed up the 25 or so kilometers to Kbal Spean, it started raining pretty hard. 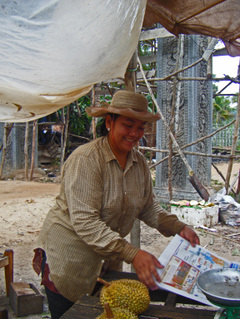 Narin smiled, turned to us and said: "this is quite unusual, it is early for the rains to start, you must be good luck." Here's another Durian story, some friends of mine have a bunch of siblings...so many that I think I've lost count. When they were young, their Mom, always so resourceful, used to lock up the Durian in a cabinet with chains and a padlock! So what's your Durian story? 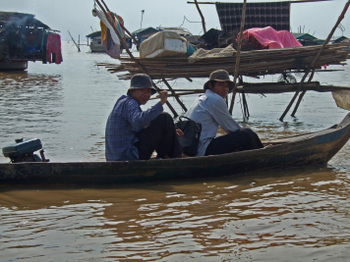 Even though the previous day had been pretty full, from sunrise until our afternoon trip to Lake Tonle Sap, we were ready to go the next morning. 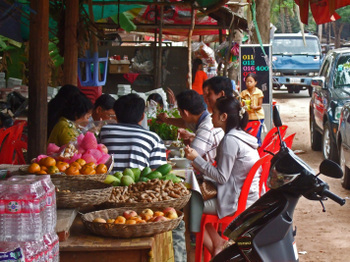 I was especially rarin' to go, since Narin had told me we'd stop at his favorite noodle stand on the way to our first stop Kbal Spean, which was a bit out of Siem Reap. 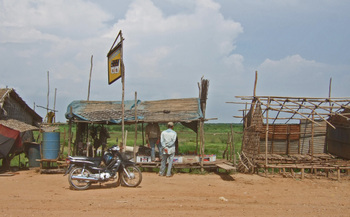 We stopped at a crossroads village outside of Siem Reap. The place was colorful and bustling, dusty and yet somehow alluring. 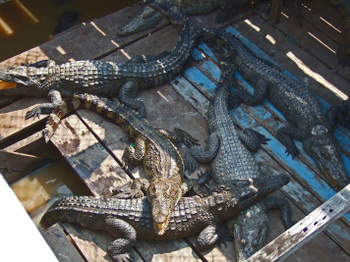 And tons of tourists and visitors in sight....except these were mostly from Phnom Penh. 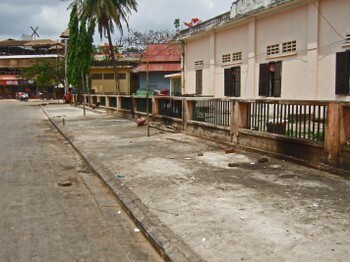 There were several mini-buses parked alongside the road, along with SUVs, and motorbikes. 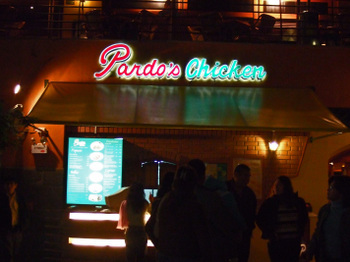 This place was doing some major business. 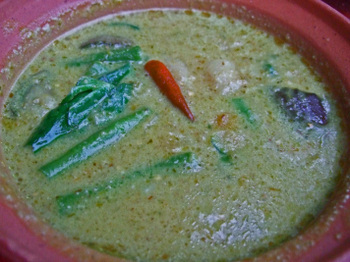 A very nice and mild coconut milk based fish noodle soup. The noodles provided were rice noodles, which looked just like the "Bun" we had in Vietnam. Along with the noodle soup several garnishes arrived. 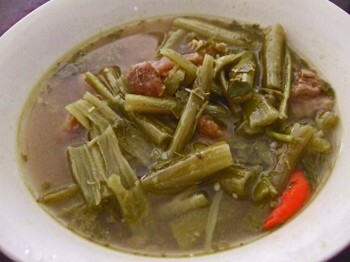 At the bottom of this bowl are some of the most amazing long beans we've ever tasted. So very sweet. A bowl covered with a plate arrived at our table. On top lime and chilies. 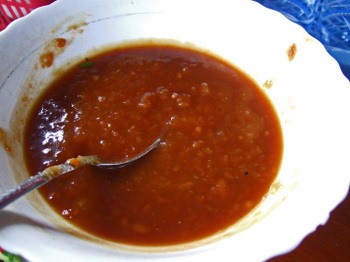 Underneath was a brown fragrant sauce, that at first glance I mistook for some tamarind based sauce. 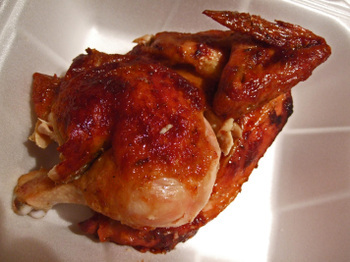 Until I tasted it, a strong and complex sweet flavor, with pungent, savory undertones. 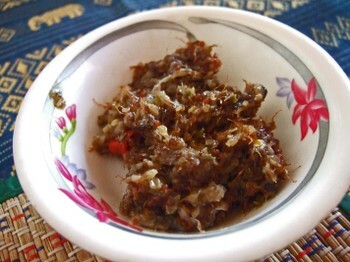 I was told it is called Tik Pha Em, and is a basic sweet fish sauce. 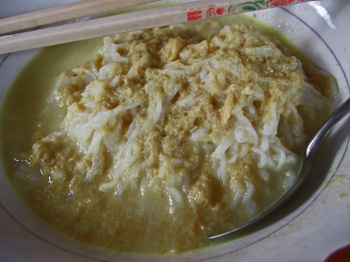 I also had Narin write down the name of the noodle dish, he called it Num Banh Chok. The only real reference I could find to it was a recipe found here. 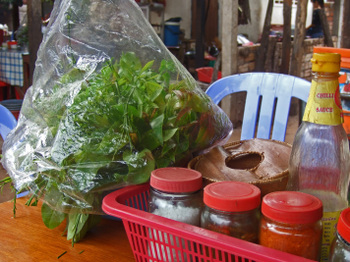 Apparently, what makes this dish unique to Siem Reap is they way it is served, with the sweet sauce, and with all of the herbs, many of which I hadn't tasted before. 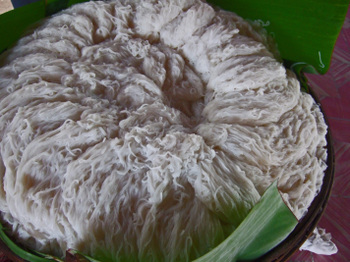 No it's not table decoration, it belongs in your Rice Noodle Soup! I asked Narin to write the name of it down for me. Poor guy, he must think I'm a nut! He spelled it Kantrop. 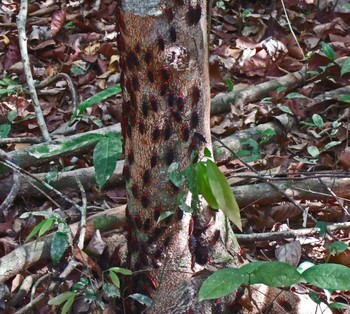 I found several citations of it, in English it's called Wampee, or Chinese clausena. It is the leaf of a certain type of citrus fruit tree. 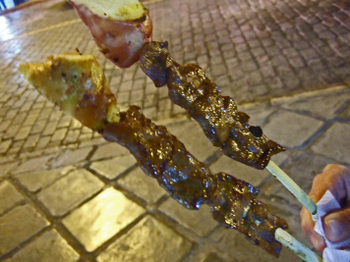 In Vietnam it's called Hồng bì, I had never had anything like it before. 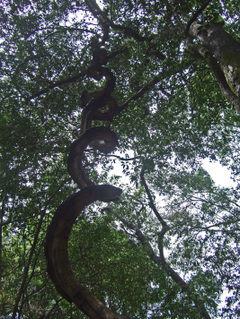 We even saw the trees growing on the trail up Kbal Spean. 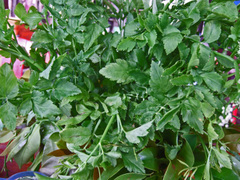 All of the herbs like the Lily Stems added an amazing flavor to the dish, making it unforgettable. 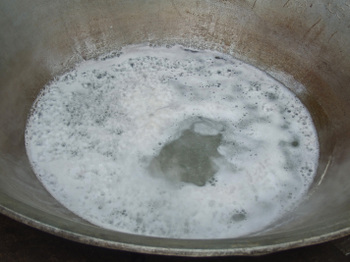 We were also told that dish was famous in Khmer legend. After searching a bit, I found a post, here. The story of Thun N'chey and the Chinese Emperor. 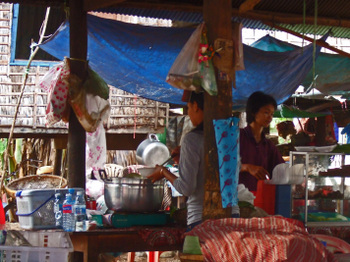 Who'd have thunk, revolutionary noodles, in a little village outside of Siem Reap. Narin insisted on paying for the meal, telling us that, if we paid, they would overcharge, and would not take reimbursement. I was determined to make up for this later. Meanwhile, the Missus had wandered away......I just knew She was up to no good! Siem Reap: Tonle Sap Lake, and being "Happy, Happy Everyday"
We didn't quite know what to expect as we headed off to Lake Tonle Sap, we had read about it in various guidebooks, and knew it was a UNESCO Biosphere, and that it was Cambodia's "larder", providing up to 60 percent of Cambodia's protein. We had also read that "there isn't much to see", and it was "an over-rated tourist trap". 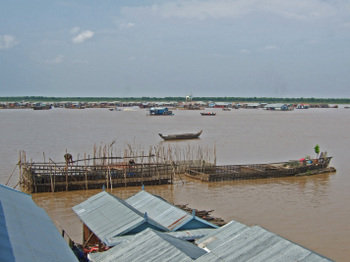 But Narin really wanted us to visit Tonle Sap, and we had learned over the course of the morning that he would not steer us wrong. And we did enjoy the ride down to the Lake. And it was during this ride, that the Missus snapped what is one of my favorite photos. 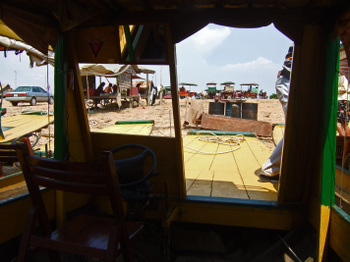 It got quite dusty as we approached Tonle Sap. 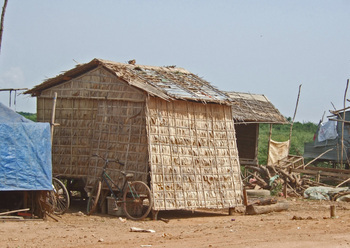 Approaching the boat docks, we saw huts lining the side of the roads. A bit flimsy you say? 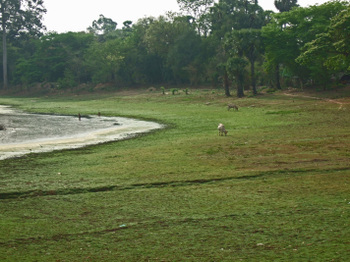 We arrived in the midst of the dry season when the lake occupies about 2500 square kilometers. 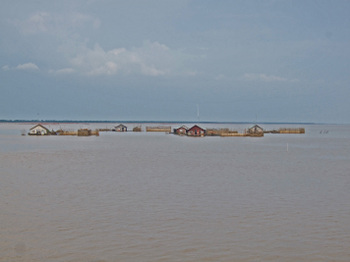 During the rainy season the lake expands to 16,000 square kilometers. 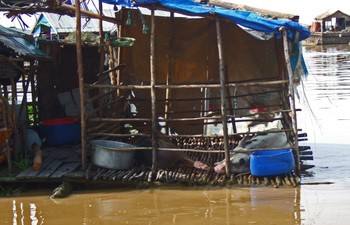 When the water rises, all of these huts are disassembled, and the village is moved to higher, dry ground. As we approached the lake, this hut drew our attention. A generator was running full blast and car batteries were being charged up. It seemed a bit strange to us, but we'd understand soon enough. 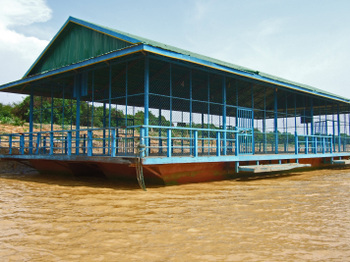 As we approached the boat dock and causeway, the heady stench hit us, a combination of rotting organic matter and gas fumes. A sudden thought went through my mind....."this is where all the fish we're eating comes from?" As our boat was steered backwards using a combination of the motor, pushing, and strategic bumping of the other boats, we had a chance to look at the surroundings. Right now, it's the rainy season, and all of this is now underwater......quite an interesting thought. 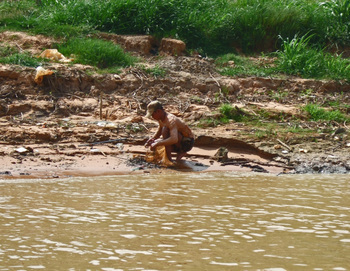 Here's a large fish trap. 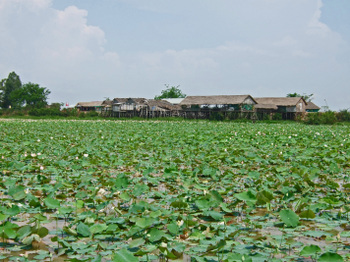 We saw 3 schools on our way to the floating village. One sponsored by Koreans, one by the Japanese, and one by the French. The most interesting thing was the enclosed basketball court. 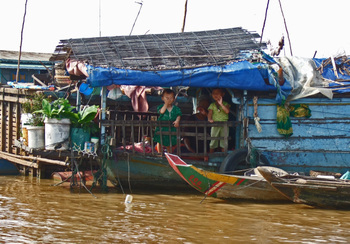 As we motored out to Chong Khneas floating village, we passed many boats delivering various goods and necessities. These blue jugs which contain drinking water. 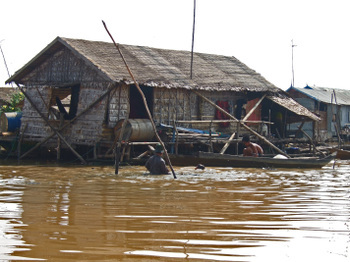 As we approached Chong Khneas we could see floating houses dotting the great brown "plain" of water. I'd heard and read of people being mobbed by children in buckets asking for money, but we were never bothered. We ended up docking at one of the Fish Farms, and Narin took us around to check out what was being raised. You don't want to slip and fall into this pen! 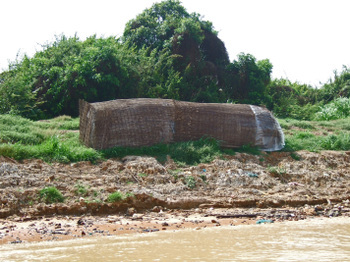 Many homes have large "pens" built along the bottom of their home/boat. 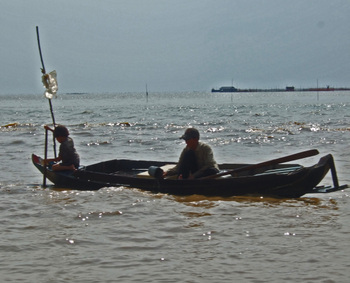 And it looks like the rest of Tonle Sap....brown water. But throw in some "chum", and you'll be startled. There are thousands of fishes in these pens. 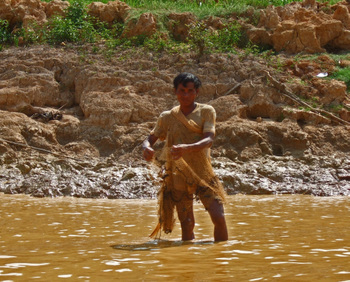 Fish is the lifeblood of Cambodia, in fact Cambodia's currency, the Riel is named after a fish. 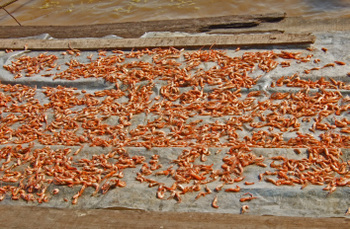 As we strolled around the floating fish farm/convenience store/restaurant, we noticed shrimp being dried everywhere. Stepping gingerly up a ladder to the roof, we had a nice view of the surroundings. Droves of Korean tourists were being boated out to places like this. It's a floating Korean Restaurant! After a half hour or so, we re-boarded our boat, and Narin gave the young man steering some instructions. 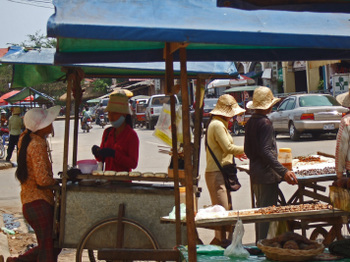 We headed off into the heart of Chong Khneas. 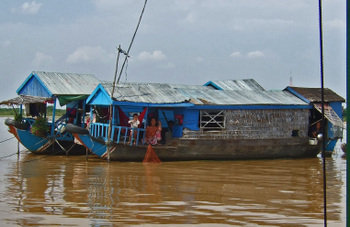 The population of Tonle Sap is interesting, 60% Vietnamese, 20% Cambodian, 20% Cham. 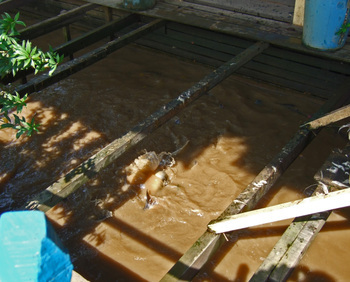 And seeing such squalid conditions can be a bit disheartening. But something interesting happened after a few minutes. We started really noticing those little touches that make the place you live "home". Whether it's your own little flower garden. Or the herbs and greens you're growing, under the wood pile. Remember the car batteries being charged? 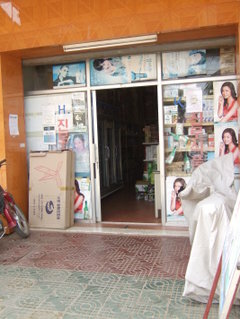 Narin joked that the one thing people in Cambodia cannot do without is television. 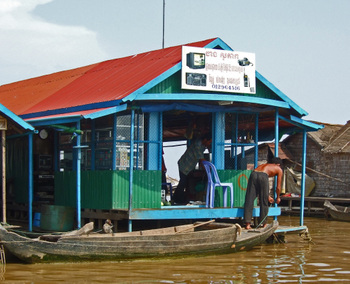 Even on Tonle Sap Lake...every houseboat, no matter how small, had a television. 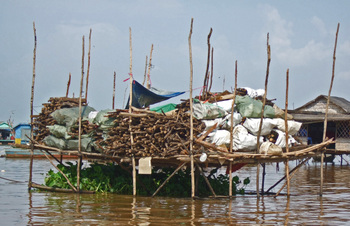 We were constantly reminded of the strength and resourcefulness of the people living on Tonle Sap. Check out the pigs. I guess some people just can't do without their pork! And instead of people trying to sell us stuff, they were throwing kisses our way. In some strange way we were deeply touched. And on a more practical level, I can imagine how many boatloads of tourists pass through here. Now I don't know about you, but if truckloads of tourists came driving up and down my street, taking photos, putting my daily life under a magnifying glass, I'm not sure I'd be waving and throwing kisses at them. 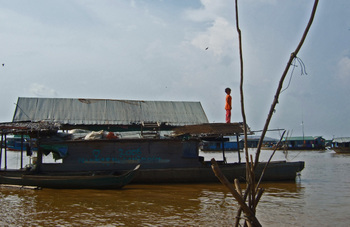 Don't get me wrong, I'm not over-romanticizing life on Tonle Sap Lake; it is a very, very, hard life. But there's something to be said about people who live in such challenging conditions who can still manage a smile and wave at the end of the day. 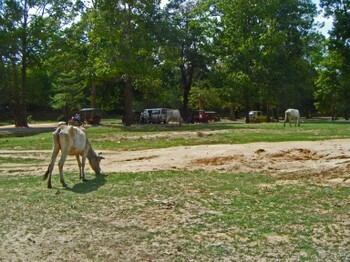 We were pretty quiet on the ride back to Siem Reap. Once we got into the city we started discussing options for the next day. Narin had also started to understand, "my peculiarities" by this time. 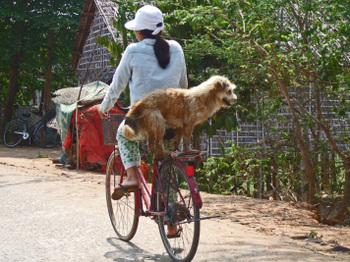 As we were dropped off, he promised to take us to his favorite noodle stand for breakfast. 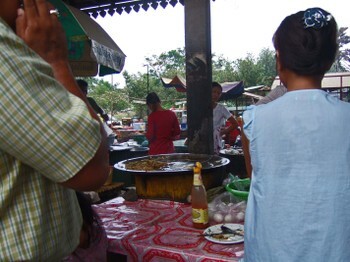 We were told that the stand served some very special Khmer Noodles. Alright...no more Fish Amok! Well, at least that's what I thought. 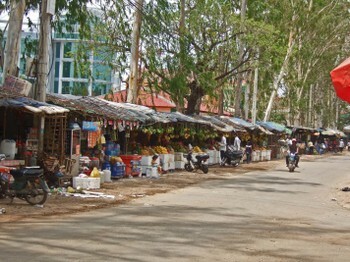 After a quick shower, we took a stroll down to the Old Market (Psar Chas) area. 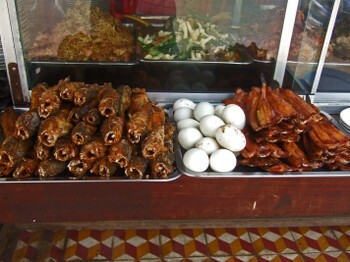 We had intentions on checking out one of the typical Khmer eateries surrounding the market. 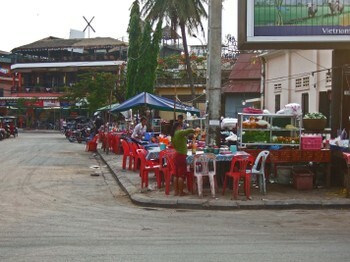 But while walking through "Pub Street" we were charmed by a young lady into stopping for a meal at Khmer Family Restaurant. 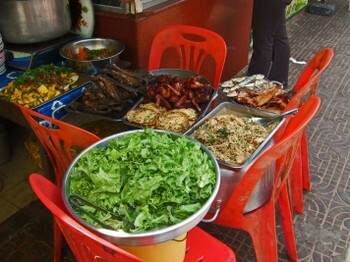 The menu was pretty much typical tourist Khmer fare, but that was fine. 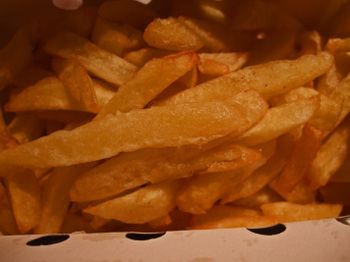 The young lady who served us was named Akin, who as quick with a smile, very warm, and quite funny. 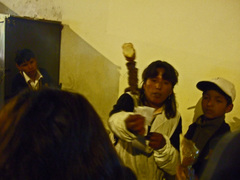 She kept having problems remembering where we were from, so we kept quizzing her; "now Akin, where aaarrrre we from?" 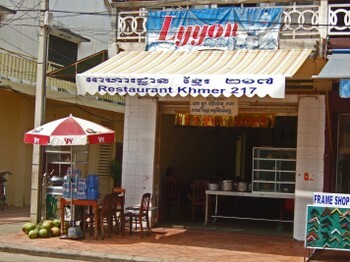 At which time she'd go down her mental list, "ummm, no, can't be Australian....."
Most of the dishes at Khmer Family restaurant are about $3, and there are special 3 item "sets" for $8, which would save you a dollar. We didn't want the "set" items, even though Akin seemed dead set on saving us that buck. We managed to order what we wanted. After taking our order, Akin charmed another couple into the restaurant. This couple was from Sweden, and were very nice, and fun. We usually don't socialize much with other tourists when on vacation, but this couple we simply fantastic; mellow, well traveled(the husband had been to San Diego! ), and they had a great sense of humor. During one of our conversations about our homes, they asked us what we new about Sweden, which was less than zero. If I were a bit faster, and perhaps wittier, I could have come up with, maybe ABBA...or Ikea? But the Missus beat me to the punch with; "oh, MEATBALLS!" Which sent the couple roaring with laughter. Yes, the two rubes from the States, the only thing they new about Sweden were Swedish Meatballs. The meal was somewhat forgettable, the Missus got, duh.....Fish Amok! 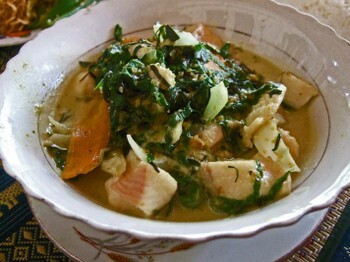 Actually this was probably the best version we had during the entire trip, it had a good quantity of fish in it(probably from Tonle Sap Lake), and the flavors were more balanced. The vegetables were severely undercooked. 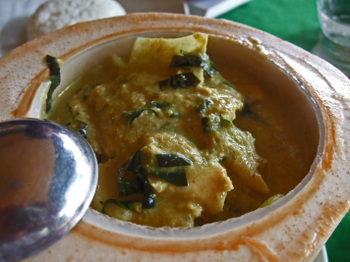 Very much like a mild green fish curry, it had a nice mild salty savory flavor. 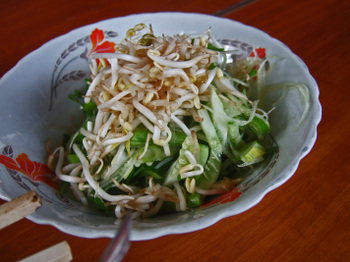 The dish supposedly had Prahok in it, but it didn't have a particularly strong fishy flavor. It reminds me of that simple, but noble goal, to try to be "Happy-Happy every day". 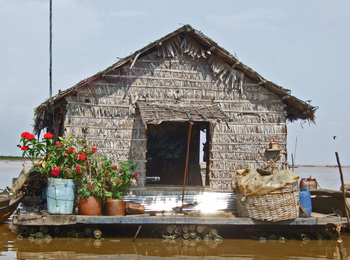 Read about Wandering Chopsticks experience at Tonle Sap Lake here. 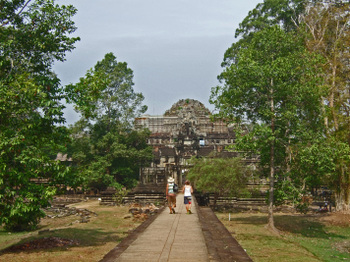 After a quick, distracted, lunch, we headed across the street and walked, albeit slowly, in the heat(temp in triple digits, and almost equal humidity) to the causeway leading to Angkor Wat. 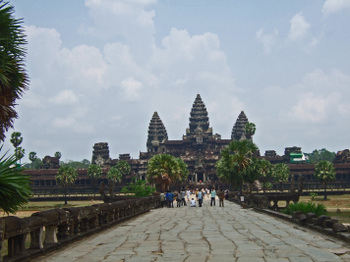 The benefit to visiting Angkor Wat during high noon is the lack of tourists. As Narin explained to me later, "after lunch, during the hottest time of the day, all the Japanese and Korean tourist head back to the hotel for a rest. 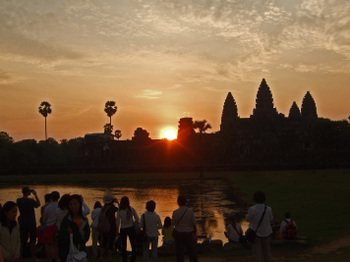 The European tourist are visiting the other temples, and will return later in the afternoon, and stay for the sunset." And he was right, the only other folks we saw were Cambodian and Thai. 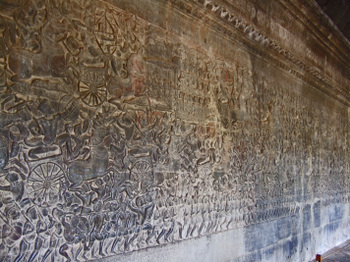 Angkor Wat is famous for the spectacular Bas-reliefs that line the walls of the first terrace. 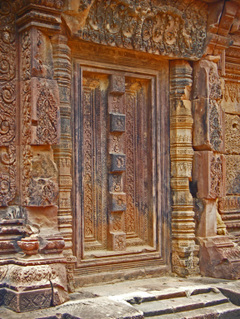 These "galleries" if you will, document great historical events, and significant Hindu legends. The galleries are meant to be viewed in a counter-clockwise direction, and we started from the Southwest corner. There's so much here, that I won't delve into them much. I think you'll enjoy the photos. Click on any of the photos to enlarge. 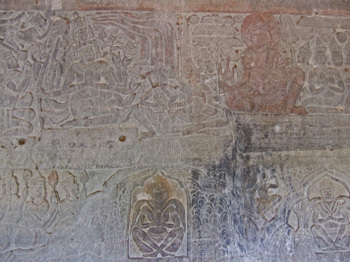 Panel 1 - Depicts the story of the Mahabharata. 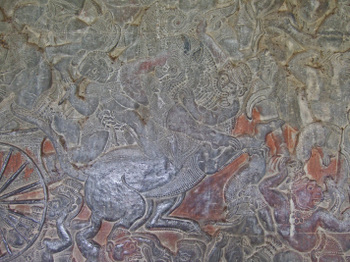 Panel 2 - Suryavarman II and his army. Panel 3 - The Heaven and Hell Gallery is broken into two; the top shows heaven where people live the leisurely life. On the bottom terrible punishments are inflicted in hell. People chopped in half, eaten by animals, and forced to watch Jerry Springer Show reruns. 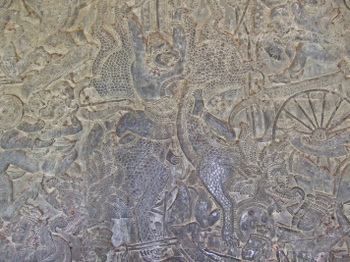 Panel 4 - Is probably the most famous Bas-relief, the Churning the Sea of Milk, the Hindu creation myth. Unfortunately, part of the gallery was undergoing restoration. The most famous portion, that of Vishnu in the middle of the 92 Gods and 88 Demons in a tug of war for the elixir of immortality was in full display. 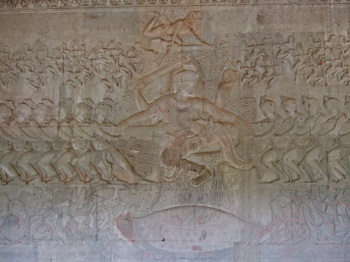 Panel 5 - Vishnu conquering the demons. 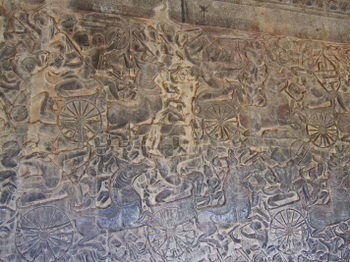 Panel 6 - Battle between Krishna and Bana. 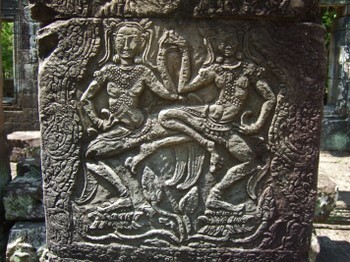 Panel 7 - The 21 Gods fighting the demons. I'm sure by now you're relieved that I'm done with the bas-reliefs, no? 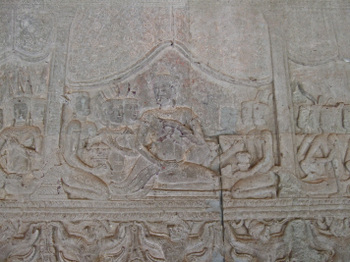 Near the end of our little "tour", the Missus saw a flash of orange...it was a Monk, enjoying the bas-reliefs. Intrigued, She insisted we follow Him. I had my reservations, "There's something just wrong about stalking a Monk. This is bad, we may get punished by being sent to one of the 32 hells....the one where we have to watch all of the episodes of Golden Girls." "Hurry up, he's turning the corner, let's go!" 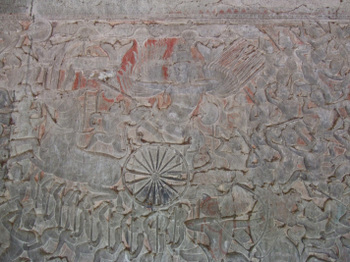 Though the bas-reliefs are the main draw of Angkor Wat, there were a few other things we enjoyed. Among them was the Hall of Echoes in the first terrace. If you lean back against the wall of this small room, and thump your chest, you'll hear and feel the vibration echo throughout the room. Who needs Disneyland? After visiting the other terraces, we were amazed...it was already 230! 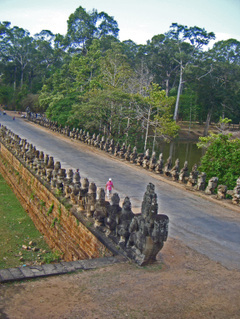 As we left the temple, a wave of tourists started pouring into Angkor Wat. 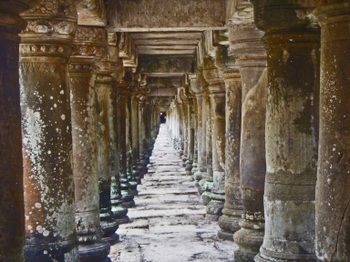 More on Angkor Wat from Wandering Chopsticks can be found here. 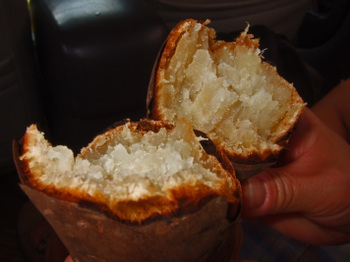 As we left Angkor Wat, Narin met us with fresh cut pineapple, iced towelettes, and iced water. We'd been out since 520 am. 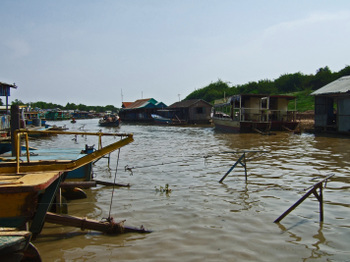 As we drove away, Narin, who'd started to get to know us, asked us if we'd like to visit Tonle Sap Lake. 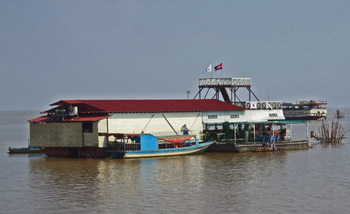 Having read in various guides to Cambodia that Tonle Sap was a bit of a tourist trap, we weren't quite sure. But Narin said, "I think you would like it." He also told us not to worry, we'll take care of the entrance and boat, and he wouldn't charge us extra for time and mileage. 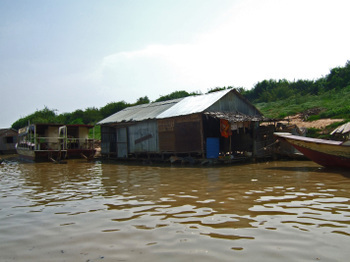 Because of all the questions we asked, he really wanted us to see Tonle Sap Lake. It was the fragrance of the roasted sweet potatoes. 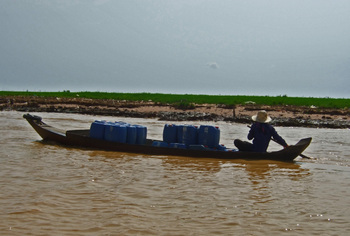 Coming up - Tonle Sap Lake. 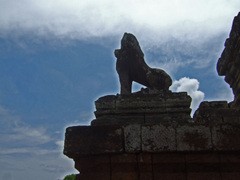 I know many have been waiting for more on the Siem Reap portion of our trip. The biggest problem for me is trying to figure out which photos to use. Over the course of our trip we took over 4500 photos, and discarded many. But we are still left with about 3700! But without further ado, let's move forward. We had no problem waking at 430 am in anticipation of our 520 pick-up. The combination of our still present jet lag, and our excitement over-rode our internal clocks. Our Driver, Narin was there to pick us up exactly at 520am. Narin seemed to be a very nice, mild-mannered, calm individual, and once the Missus started up with Her incessant questions(everything but "why is the sky blue") , Narin warmed up and started smiling a lot more. He took us to get our passes(with your photo), and asked us what we had in mind, and helped us plot out the day. And soon we were off. On some very good advice, we had decided on hiring only a driver. 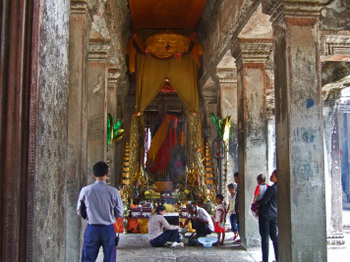 Drivers are allowed to drop off and pick-up tourists, but not enter the temples. Only official guides (costs $2000, + a test, + some, ummm, "connections") are allowed on Temple grounds. At every site you're supposed to show your pass to the guards. Some are a bit more diligent than others. 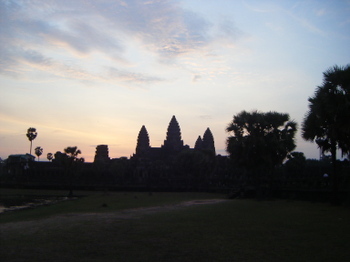 The main reason for the early wake-up was for the sunrise at Angkor Wat. 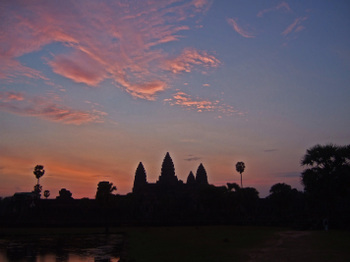 We looked for the classic shot of sunrise at Angkor Wat, from the pool on the Northwest side. What this photo doesn't show is that everyone else is trying for the same shot. Even though we had been told by several people how annoying all the clicking of the cameras and jockeying for position was, we never did get that feeling. Perhaps deciding to visit during the hottest month of the year wasn't too bad an idea. By this time we decided to extricate ourselves from the crowd, crossed over the causeway and took more photos of the sunrise. Knowing that we'd be returning later that day, we quickly made our way back out to the car. 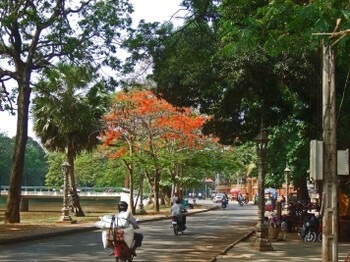 we quickly arrived at Phnom Bakheng. 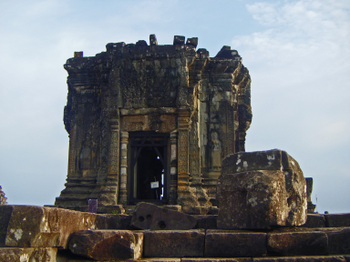 Phnom Bakheng, situated up a hill(sometimes called, "The Strong Hill") was one of the first major temples built in the Angkor era, at about the 9th Century AD. 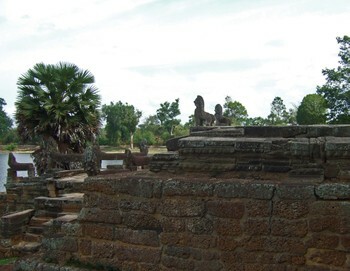 It is believed that the first capital of the Khmer Empire, Yaśodharapura(City that Bestows Glory) was built around the Phnom Bakheng, by Yasovarman I. 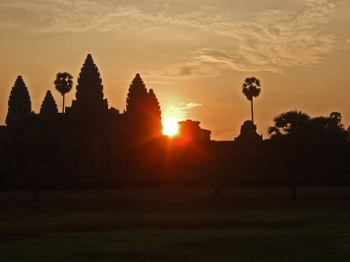 Due to the hilltop location, Phnom Bakheng is usually packed with tourists during sunsets. All this traffic has badly damaged the original stairways up the mountain, which are now closed off. Instead, a trail wound it's way around the mountain, and since it was still fairly early in the morning, the weather was still cool, and we only had the constant electrical buzzing of Cicadas to keep us company for the short walk up the hill. 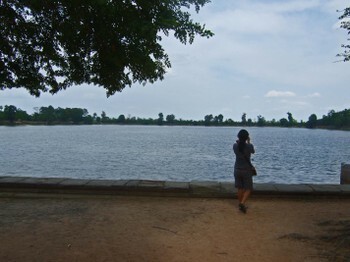 Having the Phnom Bakheng to ourselves only heightened the feeling of awe and wonder. 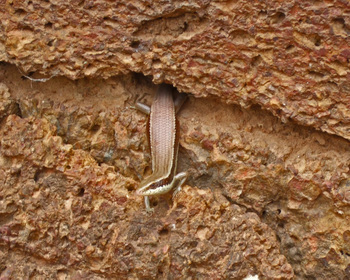 And while the Missus was climbing about exploring, I just circled. I still had some reservations about walking on the ruins. And though I would get over the feeling that I was somehow a party to destruction, the thought was always hovering about in the background. Because this site is elevated it is very popular during sunset. In fact, I've heard it's downright sardine city! During the evenings you can catch elephant rides up and down the mountain as well. 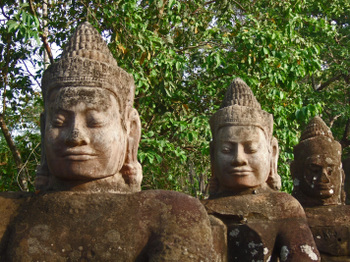 The next stop, Angkor Thom. 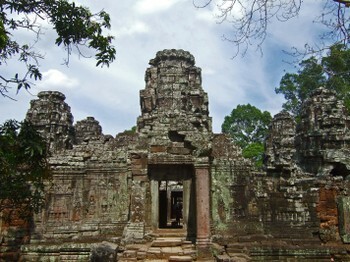 Many persons I know who have heard of Angkor Wat, believe that Angkor Wat is the only ruin in Siem Reap. 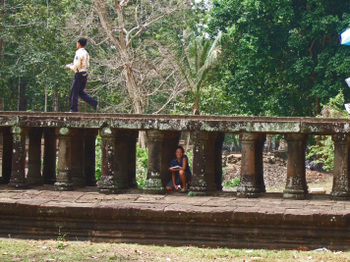 They've never heard of the "Great City", Angkor Thom. 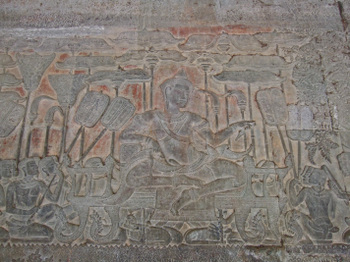 In the 12th Century, the Kingdom of Champa, and the Khmers were at war. 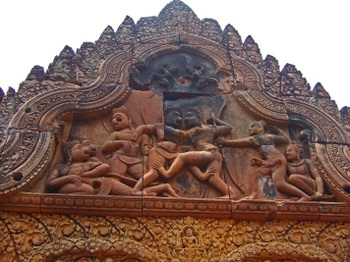 In 1166, the Khmer ruler Yasovarman II was assassinated, supposedly by one of his subordinates, Tribhuvanāditya. 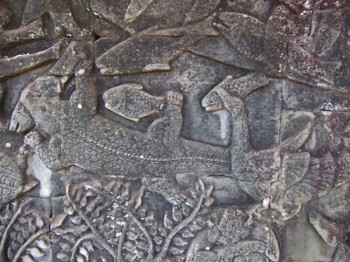 Sensing the instability in the region, the Cham, in war canoes crossed Tonle Sap Lake and invaded Angkor, destroying Yaśodharapura, and killing Tribhuvanāditya. 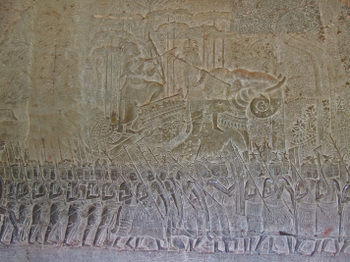 under the leadership of the person soon to known as King Jayavarman VII the Cham were defeated and driven out. 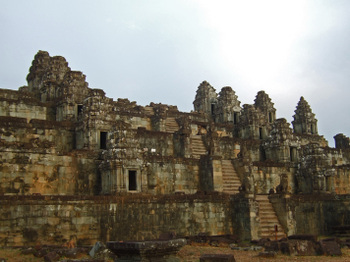 Seems that Jayavarman VII was quite the builder, and one of his greatest achievements was the centralized city of Angkor Thom. 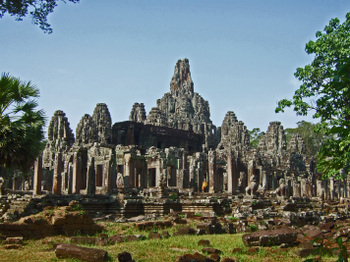 I've read accounts that have said that within the 9 square kilometers that comprised Angkor Thom resided anywhere from 100,000(low end) to over a million(high end estimate) people. 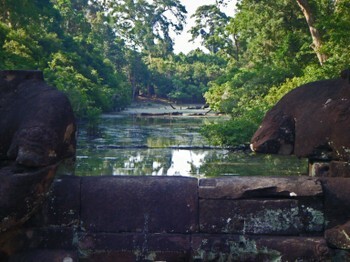 After reading a bit more about Angkor Thom, I couldn't help but admire the combination of practicality: the city was surrounded by walls 8 meters high, and huge moats, that provided water, as well as protection. Hard to believe from this pastoral scene, but I was told that they used to have the moats filled with crocodiles....for a bit of extra "insurance". 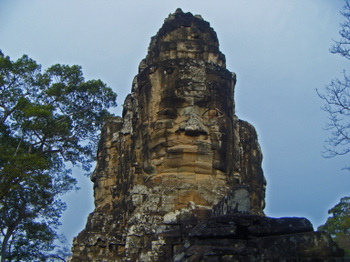 And spirituality: From accounts I've read, Jayavarman VII was a fervent Buddhist, so when he was inaugurated, so was Buddhism, replacing Hinduism. 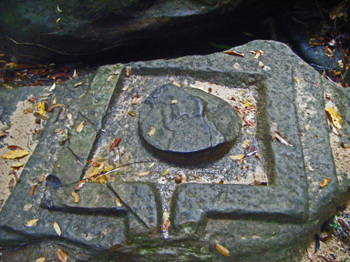 I've also read that when the K hmer fell to the Cham, so did their faith and belief in Hinduism. 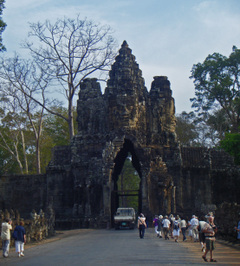 The South Gate is probably the most famous entrance to Angkor Thom. 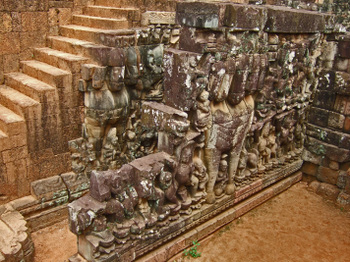 The entrance portal was built to accommodate elephants entering the city. It makes for quite a sight. 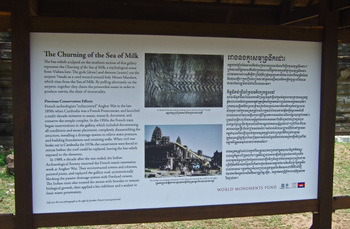 You can read more on The East Gate, and on Angkor in general on Wandering Chopsticks post here. Each head faces one of the four cardinal directions. If that weren't enough, our next stop was one of my favorites. 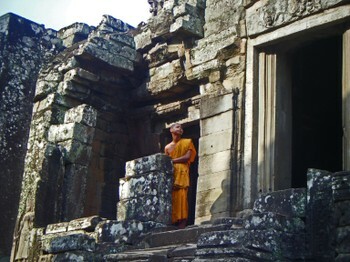 The Bayon. From afar, it looks like a pile of ruins, with spires rising out of it. 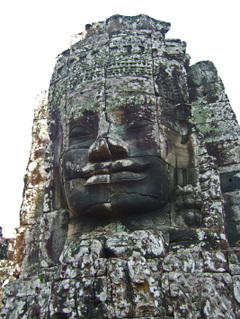 But each of those "towers", holds 4 faces, each face has that mysterious, sly-knowing smile....the "smile of Angkor". According to literature, there used to be 54(yes, numerology is very strong) towers, but now only 37 exist at this temple. 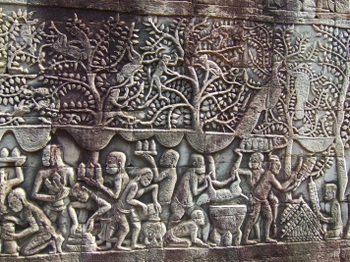 The Bas-reliefs at the Bayon are also magnificent. 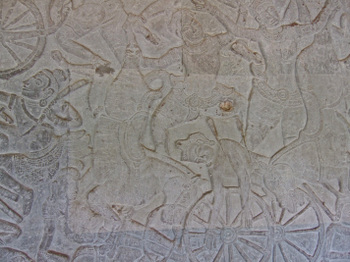 They are carved much deeper into the sandstone, really projecting the various scenes. I'll go into these a bit later on. 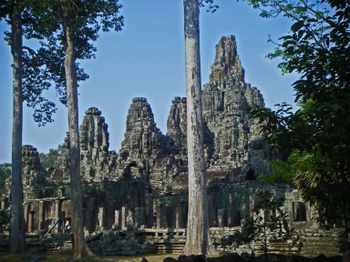 We enjoyed The Bayon so much, we decided to return later on. 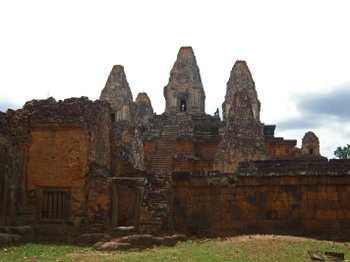 The temple consists of 3 enclosing walls and a top terrace, where the forest of towers reside. There are a few stairways, and one good metal staircase. 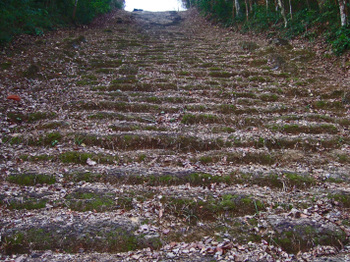 You need to watch your step, some of the stairs are really worn down. Is it just a dream?" Egad! You gotta be kiddin' me.....I'm standing among one of the great wonders of the world, and the best I can do is a "Bad 80's" song by Rockwell? Now for the, "yes we're tourists, and sometimes we do cheesy tourist things" portion. 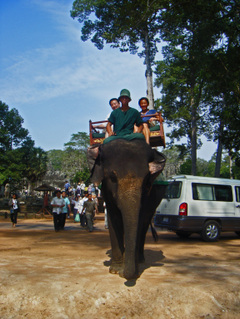 The Missus had always wanted to do this...so for $10 a person, we rode an elephant around the Bayon. I was a bit concerned for the elephant's sake, but was told that if this elephant wasn't giving rides, it would be doing logging work. So I guess this is the lesser of 2 evils. So what about the ride? It's bumpy, and really no big deal. We can now cross the elephant ride off our list....no need to do it again. We were also told that the elephants have set hours, with breaks. Must be a pretty good union.... We did see elephants trotting "home" for lunch. They can move pretty fast. 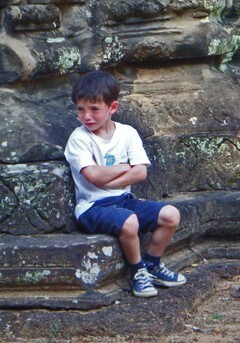 Our next stop was the Baphuon, just North of the Bayon. 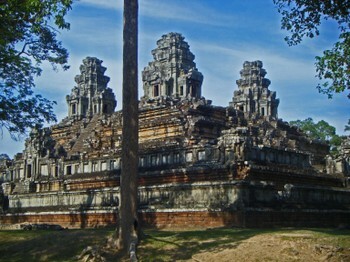 The Baphuon was built around 1060, and is still undergoing restoration. 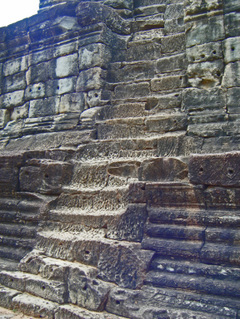 For us, the most interesting feature of this temple is the raised sandstone causeway leading to the temple. 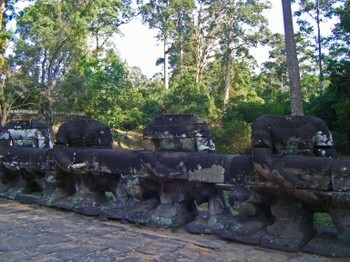 Next stop was the Terrace of the Leper King and the Terrace of the Elephants. The place was fairly crowded when we arrived, but we enjoyed the view, and the various amazing Bas-reliefs. 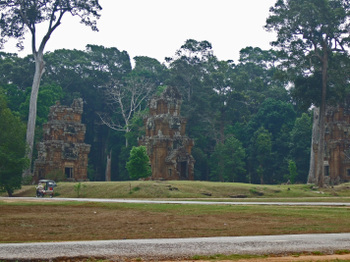 We took a walk across the road to Prasat Suor Prat, the so called "towers of the tightrope walkers". The most popular story is that tightrope walkers walked on ropes tied from tower to tower. Another says that the 12 towers were used to resolve disputes. The individuals were placed in different towers, and after a few days the person who was in the wrong would become ill. To his day no one is sure. 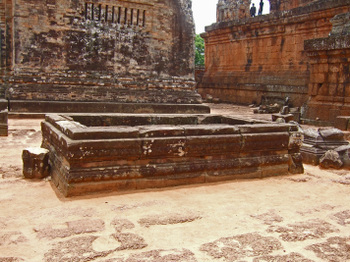 Behind Prasat Suor Prat are 2 buildings called the Khleangs. No one is sure what the purpose of these buildings are. After walking about, Narin asked us if he could drop us off for lunch. One of his customers needed a ride to the airport. 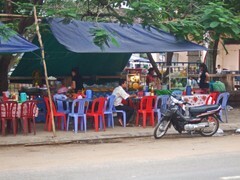 We would have lunch at one stands across from Angkor Wat, and than head on over to Angkor Wat right across the street. This wasn't a problem with us. We just wanted something small to eat...the combination of excitement and heat had repressed our appetites. We had a large order, which was served in a coconut...all it needed was an little umbrella to complete the picture. 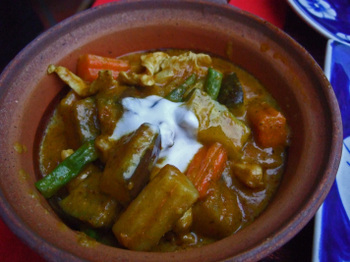 Actually, this tasted much better than what we had at Khmer Kitchen. Much richer, and not as sweet. And after having all of that very low grade rice in Vietnam, we really enjoyed the rice. "Hopefully, we'll be hearing about Cambodia soon (hint-hint)." So sayeth Ed from Yuma, in one of his recent emails. I guess this means that I need to get a move on. We arrived in Hanoi from Lao Cai station at a bit after 5am. Say what you will, but our experience is that the trains do run on time in Vietnam. 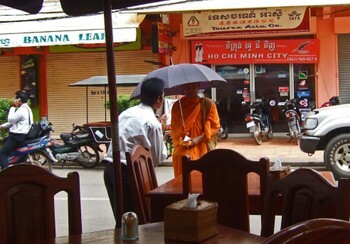 It seemed that the rain had followed us to Hanoi, as there was a steady drizzle coming down. After disembarking, we walked over to the Taxi stand, and started negotiating a fare to the airport. The guy running the place firmly stated $20/US, a bit on the high side. So, fine, I wrote 140,000 VND on a piece of paper. When the guy saw this his eyes popped out of his head, and he wrote $20! OK, I wrote 120,000 VND, even in the darkness I could make out the veins in his neck bursting through his skin. 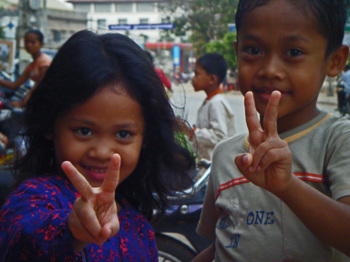 He wrote 300,000 VND, I wrote 200,000 VND, he wrote 280,000 VND, I wrote 240,000 VND. By this time, my "good cop" the Missus, played Her hand, She grabbed my arm, and started leading me out to the street, and said real loud, "we can get a taxi on the street". The guy relented, and we got a taxi to the airport for 200,000 VND. But not without a catch. Our taxi was driving through the soaked side streets of Hanoi, when the driver suddenly stopped in the middle of the street. He walked out of the cab, which kind of freaked me out! After a few minutes he returned and said, "you get out now!" At which point, not being sure of what was going on, I was starting to get into a fighting mood. He basically kicked us out of his taxi, and another taxi appeared in it's place, and this guy waved us in. I guess there was some kind of side deal, this driver took us to the airport without uttering a single word. In case you were wondering, along with looking like plastic, it tasted like plastic. 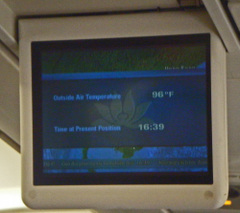 As we arrived in Siem Reap, we glanced up at the display, and it read 96 degrees! 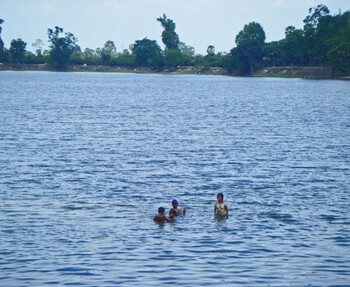 We knew that this was the hottest month of the year in Cambodia, and yes indeed it was going to be a hot one. I was ready for a hot, and sticky miserable time. 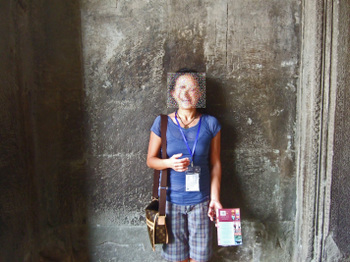 But something happened to me on the tarmac in Siem Reap. Both the Missus and I immediately made out the fragrance of plumeria in the air...and we couldn't help but smile. 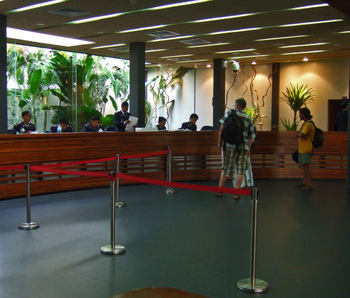 Customs and immigration is usually a trying ordeal, and we expected such at the airport. And when we saw the gauntlet that was the immigration line, we thought we were in for one. But it was not to be. I paid our $20 a piece and we moved on down the line. Our money and passports were passed from officer to officer, sort of a passport bucket brigade. And these guys were smiling! In fact, the Missus thought one of the officers was calling Her, and walked up to the Guy. It turns out that Her maiden name sounds just like a Cambodian word. After checking Her passport, instead of being irritated, the Guy cracked up laughing, and started telling everyone else at the desk. They were just having a good old time. The Missus went to exchange some money, and the teller, realizing She made a mistake, started giggling. We certainly were not in Vietnam any longer. 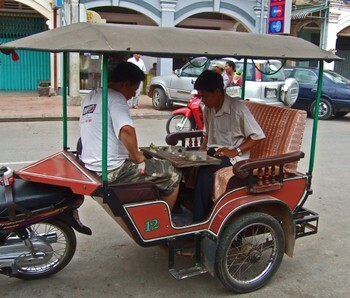 There is a central Taxi desk at the airport with a $5 flat rate to hotels in Siem Reap. Things were very organized. 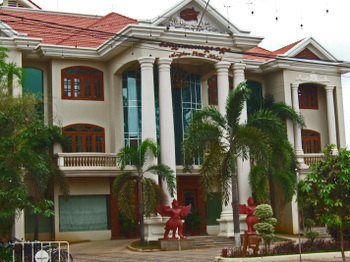 The hotel for our stay was the Angkor Star. The hotel was interesting, it was a bit older, but very clean. There was a small "casino"(I'm really stretching the definition) attached to the lobby, with the universal casino scent(damp-cigarette) making its way out into the lobby area. 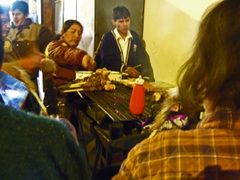 But everything was more than adequate for $30/night. 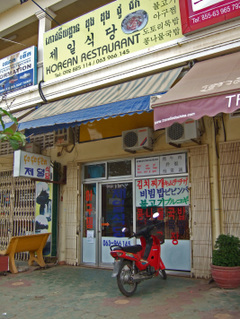 Also, the Hotel was located on Sivutha Street, one of the main drags. 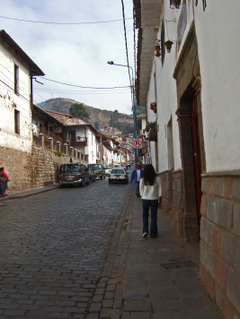 It was also one of the few streets that actually seemed to have a "name". After rehydrating, and taking a shower, we decided to take a walk and grab something to eat. It was over 100 degrees by now, with the humidity hovering in the 80's, but maybe because we were so excited to be here it didn't bother us much. We walked down Sivutha(the heat just makes you slooow down) looking to find "Pub Street", but no one seemed to have a clue. 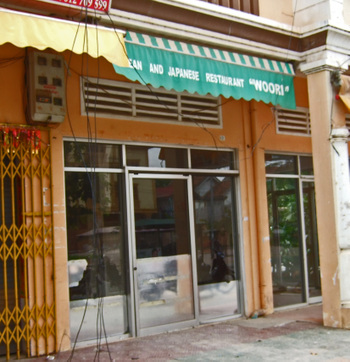 Of course, we could have stopped and grabbed some noodles or something else at any of the many restaurants lining the street. 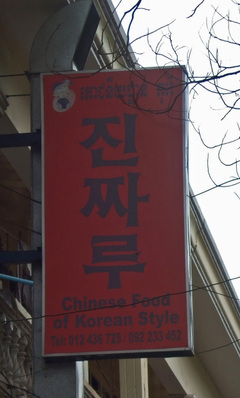 Or maybe have some...... Korean Food? 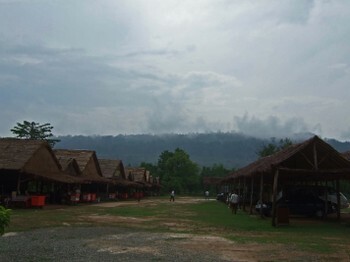 It seems that the latest tourism wave in Siem Reap is from Korea. 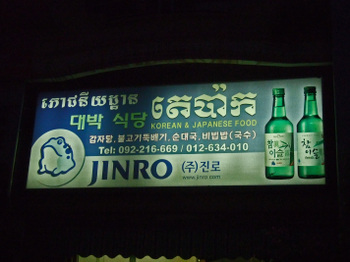 I counted at least 6 Korean Restaurants, and several hotels seem to cater specifically to Korean tastes. Here's a restaurant in transition; the cuisine of the last "wave", Japanese Food, is being served in addition to Korean Food. There's even a Korean Market on Sivutha! In all seriousness, I was very impres sed by what troupers all the Korean tourists were. 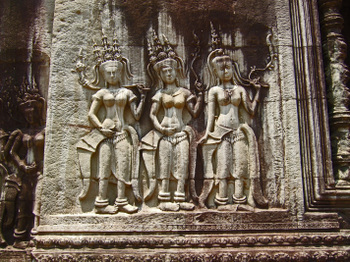 The older Ladies in their visors with towels wrapped around their necks(don't forget the parasols) marched through the ruins at Angkor in the mid day heat and humidity with aplomb. They sure were tough. 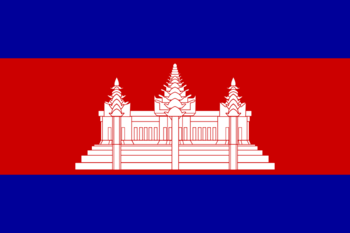 We also noted all the humanitarian efforts being provided by the Koreans and Japanese in Siem Reap in our travels. My favorite vignette was when the Missus offered an older Korean Lady Her seat, to thank her, the woman handed the Missus a piece of chocolate. There was something a bit different about our planning for Cambodia. For once, I hadn't really done any research on restaurants or food. I did read the guidebooks and various forums, but didn't take notes. So, with no plans, we headed toward where we thought Pub Street was. But it seemed that none of the locals knew or had heard of "Pub Street". Finally, we came upon the Hospital(Hospital Street, of course! ), and I recognized some of the names, the Blue Pumpkin, Happy Herbs Pizza(guess what the Happy Herb in the pizza is? No th anks, I've already experienced the late 70's...no need to go back, god help me if I ended up in the 60's), and the Red Piano. 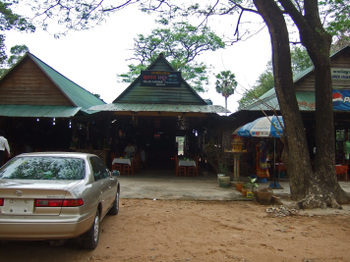 Finally, we came upon our destination, a place that many of the guidebooks and forums recommend, Khmer Kitchen. 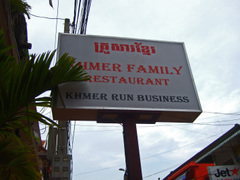 Khmer Kitchen is supposedly known for Khmer Home-style dishes. And so I thought I'd give it a shot. Now it's disclaimer time. Siem Reap seemed to have the worst lighting I've ever experienced in restaurants. Ranging from "bug killer neon green" to almost pitch black, photos were always a challenge. 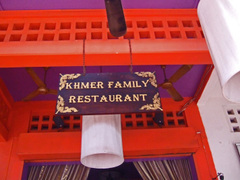 Khmer Kitchen was no exception. And since I don't use a flash...well, my apologies in advance. This restaurant down an alley of restaurants was pretty packed. 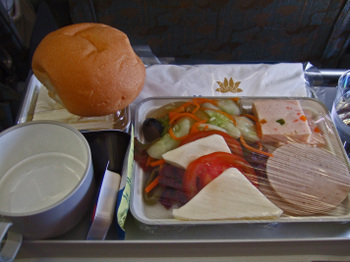 We were seated at a table, handed the binder with laminated pages that is the menu, and eventually made our selections. 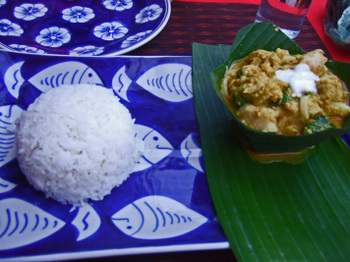 The one dish I kept reading about was Amok, a steamed curry like dish usually made with(for us tourists) fish. So it was a must for us to try. 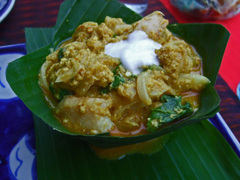 Coconut and galangal were the principle flavors in this dish. 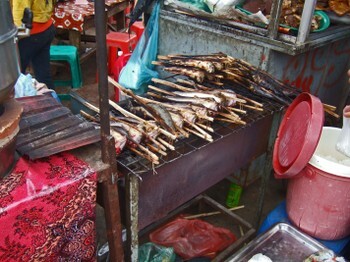 The fish, sliced into small pieces were very moist and mild. 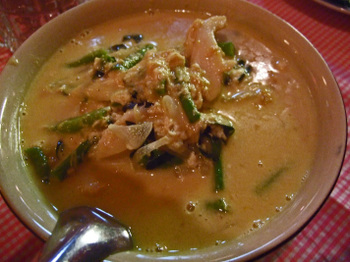 What we noticed in Siem Reap was how fabulous the green beans tasted, even in this dish they stood out. 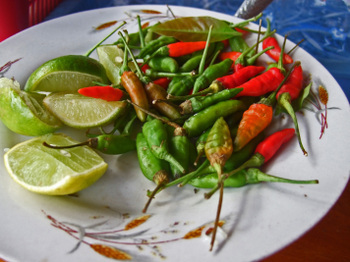 Going through the various forums, I found that many people were really disappointed in the fish amok, and Khmer food in general, which is often described as Thai food without spice. I'd disagree, Cambodian food is much more subtle, and as I learned later, very dependant on the Kroeung or the flavoring paste. 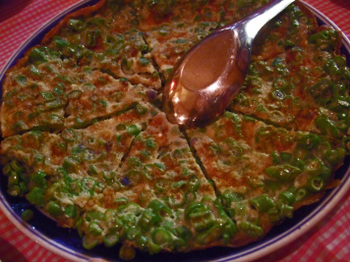 It is a mild dish, and not something I'd crave, but the Missus really enjoyed it. 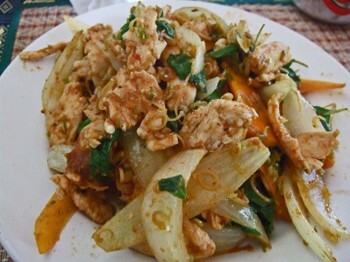 I've had this dish prepared Vietnamese style, and this is totally different, though I've been told the origins(the French influence) are the same. 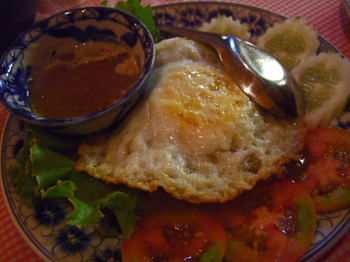 In this case, under the fried egg lay chopped beef in a sweet-peppery gravy. It was delicious, as was the additional sauce provided. 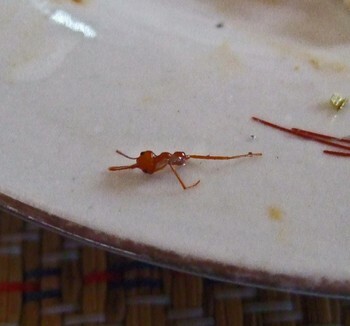 One thing you'll notice is that at these types of restaurants, someone comes to your table and a scoop of rice is put on your plate by the Server. We made good use of the rice in this case. 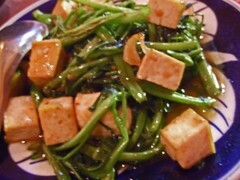 Water Spinach with Tofu. I had wondered why the Missus ordered this. 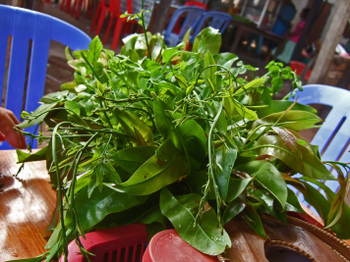 She didn't know that water spinach is Ong Choy(Kongxincai 空心菜). This was very bland, and the tofu was lousy. 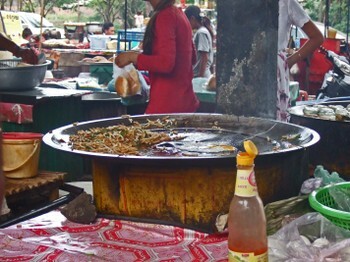 This was a pretty dish, which we saw at many of the food stalls in Psar Chas(Old Market). 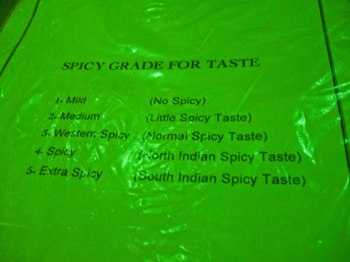 However, it did not have much flavor. We returned to our hotel, and tried to get in touch with the driver who had been recommended to us. We had communicated by email, and were told that he was booked, but that he'd find someone for us. And yes, he did indeed have a driver ready for us....with a 520am pick-up. No problem, we could dream of what lay before us. Everything was working out...as if someone was looking out for us.